These easy and quick Lamb Chops with Mustard-Thyme Sauce make an amazing family favorite dinner! 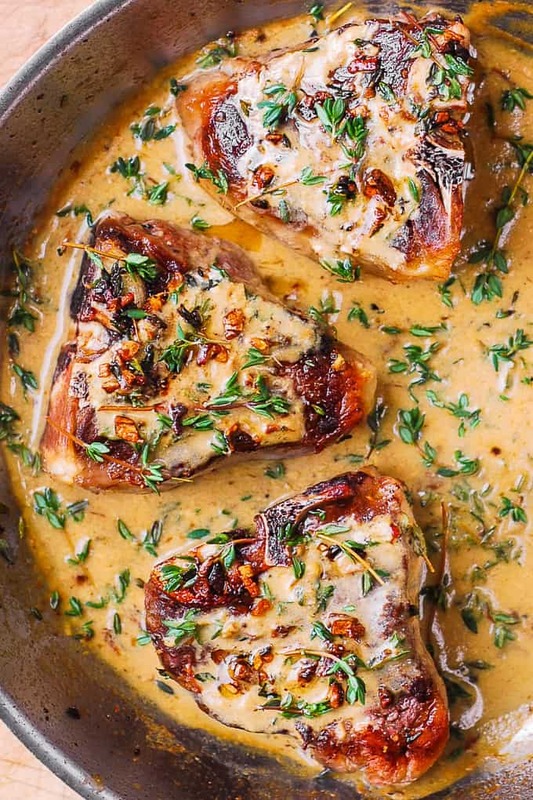 Creamy mustard sauce is made with garlic, Dijon mustard, red wine (or white wine), and fresh thyme. Lamb chops are tender and juicy. These Mediterranean pan-fried lamb chops can be cooked in a stainless steel skillet or in a cast iron pan. The pan-searing process is very similar to how I cooked garlic lamb loin chops. 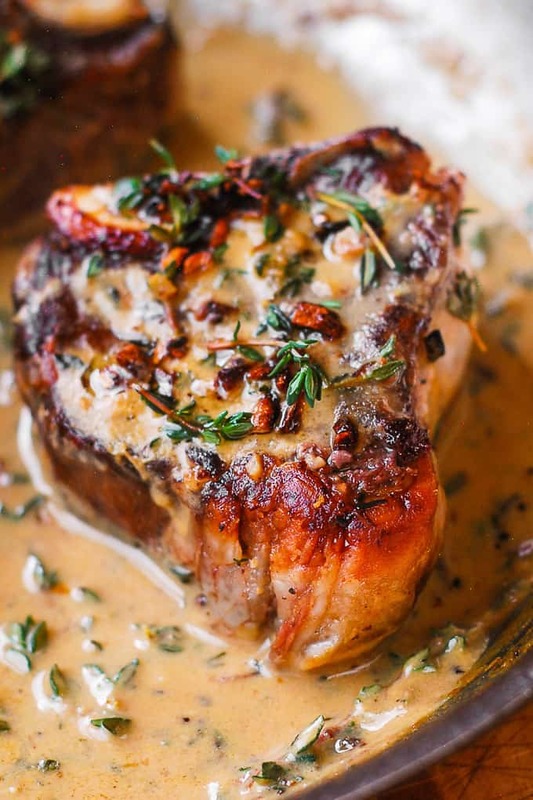 Your family will love the creamy mustard sauce texture and the savory flavor of lamb chops! They will go great with green beans and bacon or with oven-roasted asparagus with bacon. The best part about the sauce? It takes just 4 ingredients. Garlic, fresh thyme, wine, and Dijon mustard. This combination produces the best sauce for lamb chops. I used white wine, but you can definitely use red wine for the sauce. The best part about the lamb chops? It takes only 10 minutes to pan sear them. And, thanks to the creamy garlic sauce, the lamb chops are moist and tender! How long does it take to cook lamb chops? Heat 1 tablespoon of olive oil in stainless steel or cast iron skillet until hot. Pan sear 4 lamb chops for about 4 minutes on each side. Cover with the lid. Remove from heat. Allow the pan-seared lamb chops rest, covered, for about 5 more minutes. What herbs go with lamb chops? In a medium bowl, combine 2 tablespoons of olive oil, 2 tablespoons lemon juice, 0.4 oz fresh thyme, 1/4 teaspoon of cracked black pepper, 1/4 teaspoon sea salt, 4 garlic cloves, minced. Mix. Arrange 4 lamb chops on a large plate. Pour the marinade over the lamb chops. Make sure that each side of lamb chops is coated with the marinade. Allow the lamb chops rest for 30 minutes in the marinade before cooking. Pat dry lamb chops with paper towels to get rid of extra moisture. Heat 1 tablespoon of olive oil on medium heat in a large skillet until hot. Cook on medium heat about 4 minutes per side. Remove the lamb chops from the skillet. Add wine, Dijon mustard, fresh thyme, and minced garlic to the skillet and bring to boil. Continue boiling to reduce the sauce, until it thickens. Add back cooked lamb chops. Simmer on low-medium heat to heat them through. 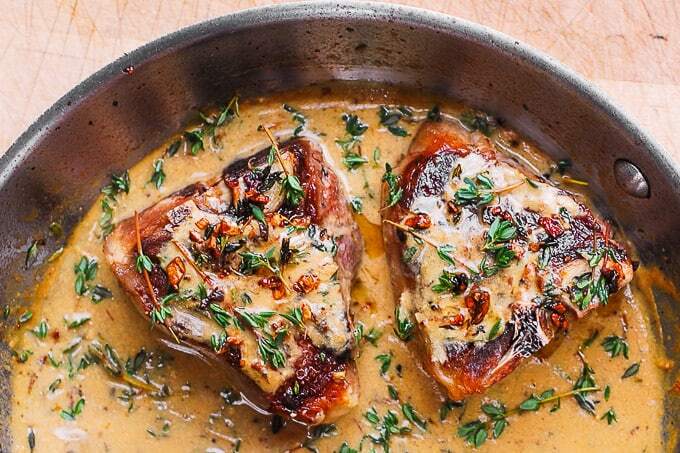 Spoon the creamy mustard sauce over the lamb chops and serve. Make the best and the easiest sauce for lamb chops! 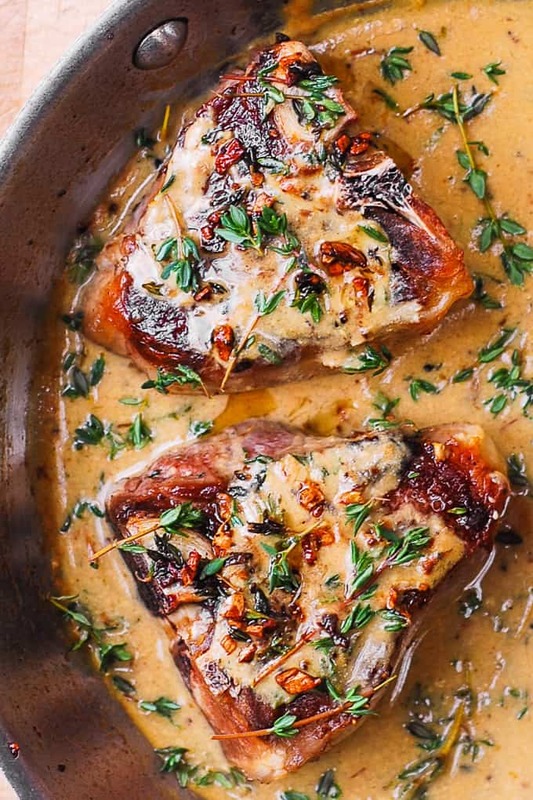 This creamy mustard-thyme sauce is made with garlic, red or white wine, Dijon mustard, fresh herbs, sea salt, and cracked black pepper. This savory Mediterranean dish will become a family favorite dinner! 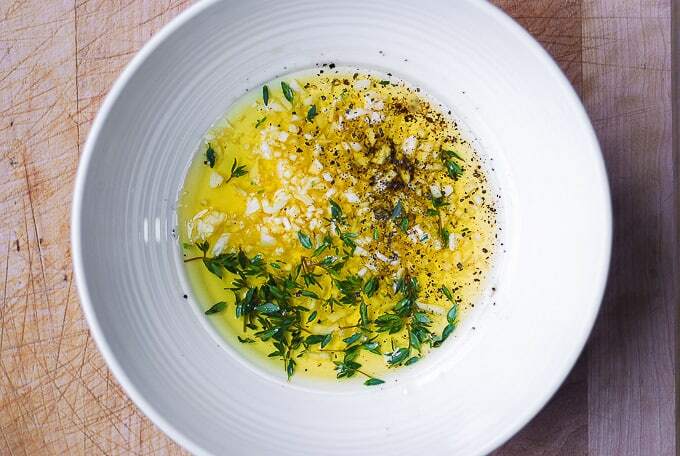 Combine olive oil, lemon juice, thyme, blacked cracked pepper, sea salt, minced garlic in a medium bowl. Mix. Arrange lamb chops on a large plate. Pour the marinade over the lamb chops. Make sure the lamb chops are covered with the marinade from all sides. Let the lamb chops sit at room temperature in this marinade for 30 minutes. Heat 1 tablespoon of olive oil on medium heat in a large skillet until hot. Add lamb chops. Cook on medium-high heat about 4 minutes on one side. Then 4 minutes on medium heat on another side. Add wine to the same skillet and bring to boil. Add mustard, fresh thyme, and minced garlic. Bring to boil and reduce the sauce, until it thickens. It should take a couple of minutes. 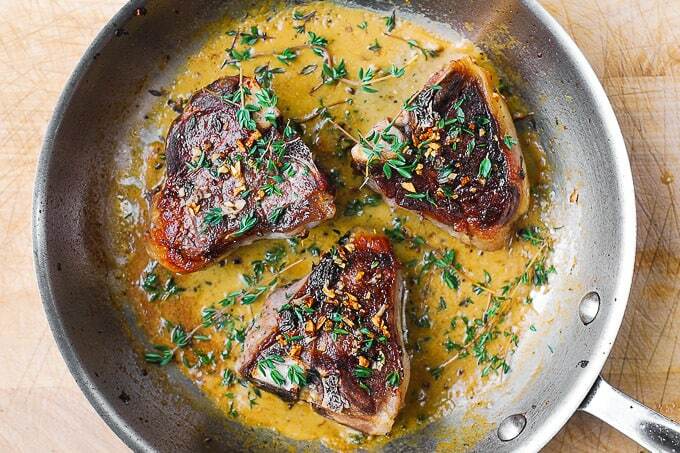 Add back the pan-seared lamb chops. Season the sauce with salt and cracked black pepper, if needed. Note: Make sure the lamb chops are cooked to medium. If not, cook them in the sauce, covered with the lid, for a couple of minutes. Then, remove from heat, and allow the lamb chops rest, covered until they are cooked through. 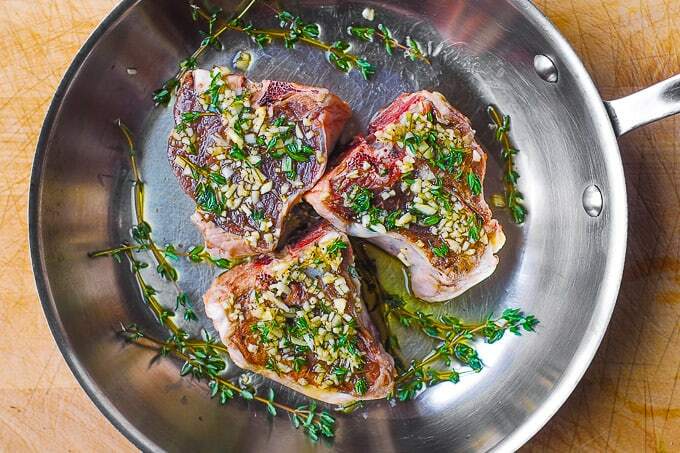 To serve, spoon the sauce over lamb chops and sprinkle more fresh thyme on top. Can you sub. meat – pork chops for the lamb? Yes, you can! Just watch the cooking times for pork chops and adjust accordingly.